Getting healthy and slam dunking disease is the name of the game for Sun Life Financial’s new initiative. 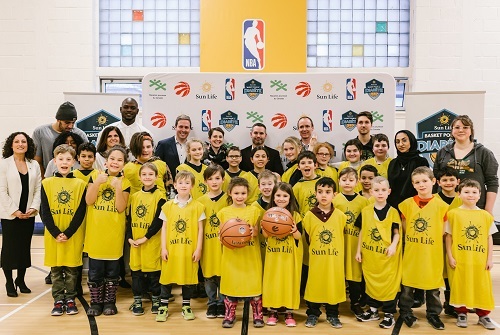 The firm gas teamed up with the NBA, the Toronto Raptors and the Boys & Girls Clubs of Canada to launch the Sun Life Dunk for Diabetes program in Quebec – the first of its kind in the province. It aims to promote an active lifestyle as a way of preventing type 2 diabetes and, as part of the initiative, kids from Boys and Girls Clubs in Montreal, Longueuil and Stoneham-et-Tewksbury will participate in a six-week health and wellness program this winter. Participants pledge commitment to complete weekly basketball-inspired fitness and nutrition challenges, including basic exercises, nutritional and diabetes education and healthy habits. Prizes are up for grabs after each challenge is completed. In addition, a newly refurbished basketball court was unveiled by Sun Life and the NBA. Members of the local community and Dawson Boys & Girls Club will benefit from the newly renovated facilities, which include new floors, baskets and more. A group of local Sun Life employees volunteered to help refurbish the facilities. "For us, at Sun Life, true wealth is about health and adopting a healthy lifestyle. With the Dunk for Diabetes program, we are continuing our efforts to stop the progression of type 2 diabetes in the country. I am so glad children in Montreal, Longueuil and Stoneham-et-Tewksbury can now benefit from this program which will be a valuable legacy in their future," said Jacques Goulet, President, Sun Life Financial Canada. Owen Charters, President and CEO of Boys and Girls Clubs of Canada, said: “Physical activity and healthy lifestyles are key to minimizing long-term health risks for children and youth. Since its inception in 2017, the Sun Life Dunk for Diabetes program has been rolled out in 29 communities across Canada.